Ben Stong, MD and Benjamin Talei, MD are esteemed and highly awarded facial plastic surgeons who are featured in the recent Life & Style magazine article highlighting the new and improved look of Danielle Staub, who is making her return to star in The Real Housewives of New Jersey reality television series. As two of the most respected facial plastic surgeons in the country, Dr. Stong and Dr. Talei were both chosen to comment on the Staub’s recent cosmetic transformation in the November 6th issue of Life & Style. The latest issue of Life & Style magazine will include quotes from two of the country’s most reputable facial plastic surgeons, Dr. Benjamin Stong of Kalos Facial Plastic Surgery in Atlanta and Dr. Ben Talei, Director of the Beverly Hills Center for Plastic & Laser Surgery. These leading plastic surgeons give their expert opinion on the evidence of Danielle Staub’s cosmetic changes since 2010. Danielle Staub is a reality television star on The Real Housewives of New Jersey and is making her return after a five-season absence. The star, now 55 years old, is coming back with noticeable improvements and youthful changes in her facial appearance. 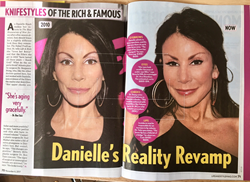 Life & Style magazine has picked up on Danielle Staub’s new look and elicited the expertise of renowned plastic surgeons Dr. Stong and Dr. Talei to comment on the type of fillers that likely created her more youthful appearance. In the November 5th issue of Life & Style magazine, Dr. Stong and Dr. Talei both remark on the subtle and natural-looking improvements that fillers and Botox have given Staub. They are quoted on the specific techniques and procedures that can create the seen changes, which includes smaller eyes, a change in brow shape, and better fullness in the lips and cheeks. They list Botox, Voluma and Juvederm as leading facial injectables that were likely used. Facial fillers are a non-surgical treatment that can effectively reverse signs of aging with minimal to no downtime. “It helps to see real life evidence of how facial fillers can improve one’s appearance, even in a reality television star like Danielle Staub. Fillers and other non-surgical cosmetic procedures for the face are affordable, quick and should not be underestimated in terms of results,” says Dr. Ben Stong. Owner and facial plastic surgeon, Dr. Benjamin Stong is dual board certified in Head and Neck Surgery and Facial Plastic and Reconstructive Surgery. He completed his fellowship under one of the most nationally renowned plastic surgeons, Dr. Andrew Jacono in New York. He has combined such a reputable level of training with his own proven experience and talent to bring patients of Atlanta outstanding results in all aspects of surgical and non-surgical cosmetic surgery. In his career thus far, Dr. Stong has earned high prestige in his field, including the Castle Connolly Top Doctors award for consecutive years. Dr. Stong also specializes in hair transplantation as well as the most innovative treatments in facial rejuvenation at The K Spa in Atlanta. Vascular Birthmark Institute of New York. In addition, Dr. Talei is a respected author, speaker and humanitarian. For additional information on Dr. Stong and Kalos Facial Plastic Surgery please visit http://www.kalos-plasticsurgery.com or call 404-963-6665. For additional information on Dr. Talei and the Beverly Hills Center for Plastic and Laser Surgery please visit http://www.beverlyhillscenter.com or call (310) 288-0641.